While breeding, seabirds are central-place foragers requiring resources to sustain high-energy requirements. Therefore, during this period, they are particularly sensitive to food-resource availability, which can vary within and between years. Intra- and inter-annual variations in Scopoli’s shearwater (Calonectris diomedea) trophic ecology were investigated at its largest colony (Zembra Island, 37°07′33″N, 10°48′23″E, Mediterranean Sea). Carbon and nitrogen isotope values were analysed in the blood (adults and chicks) and feathers (adult wing) during pre-laying, incubation, and chick-rearing in 2015 and 2016 to assess variations in stable isotope composition, isotopic niches, trophic levels, and diet inferred from isotope mixing models. Scopoli’s shearwaters showed variations in isotopes throughout the breeding season and among years, with incubation showing the highest δ13C and δ15N values, trophic levels, inter-annual isotopic niche consistency, and the most specific and narrowest isotopic niche. The difference in blood δ13C values between adults and chicks suggested trophic habitat segregation: adults feed inshore, while chicks are fed more oceanic prey. 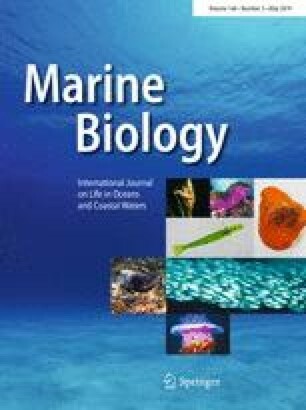 Stable-isotope mixing models based on three potential prey groups revealed that the diet could consist mainly of pelagic fish and crustaceans throughout the breeding season, whereas non-pelagic fish and cephalopods could be consumed more sporadically, mainly during incubation. Feather δ15N values suggested that the adult diets contained more zooplankton in 2014. These results demonstrated the Scopoli’s shearwater trophic ecology plasticity in response to the variable nutritional demands of breeding phases and changes in prey availability. Scopoli’s shearwaters may, thus, be valuable bio-indicators of small pelagic fish populations considered critically depleted in the Mediterranean. The online version of this article ( https://doi.org/10.1007/s00227-019-3509-1) contains supplementary material, which is available to authorized users. The authors would like to acknowledge the financial support from the Fondation Total pour la Biodiversité through the TRIBAL project (“TRophic ecology and Impacts of Bycatch on the Avifauna communities of Zembra archipelago”). The authors also thank the staff of the Agence de Protection et d’Aménagement du Littoral (APAL) for providing authorisations for access to and sampling in the Zembra Archipelago marine protected area and for their help with logistical aspects, particularly Anis Zarrouk, Mahdi Bezi, and Hassan Zaghdoudi. Special thanks go to Habib Khiari, the fisherman who provided logistical assistance, to Ridha Ouni, and to Adel Ben Dhafer, the forest guardian of Zembra. We are grateful to Michelle Corson for improving the English and two anonymous reviewers for their constructive comments on the manuscript. We declare that all applicable international, national, and/or institutional guidelines for sampling, care, and experimental use of organisms for the study were followed, and all necessary approvals were obtained.